In a letter to the Times, dated June 4th 1932, CEK Mees referred to long-distance infrared photographs of mountains, taken in Costa Rica in 1915 or 16 by Gustave Michaud and J Fidel Tristán of Costa Rica State College, which were published in Scientific American. I've been trying to track down more information about them, and it seems they were pioneers in both infrared and ultraviolet photography. Unfortunately I have been unable to find the Scientific American article to which Mees refers. Scanning through the bound volumes for 1915 and 1916 in the British Library did not reveal them. However I did find a few relevant items there and on the web. They wrote an article on Flowers photographed by invisible light in the October 10th 1914 edition of Scientific American. Most of this demonstrated how many white flowers came out 'black' when photographed under ultraviolet light, or showed some patterning that was not apparent in ordinary light. They did comment on how flowers looked in infrared but as they usually showed up as 'white' they didn't find this as interesting. 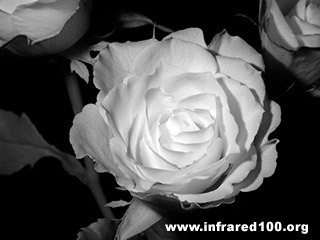 I have photographed flowers, even dark ones, in infrared. This is an example. It is actually a dark red rose, illuminated by a flash gun. This article was not in any Scientific American in 1915 but the date may well refer to January 15th, possibly in 1918 ... but I have not had a chance to track that down as yet. A further piece of research was published in Archives des sciences, March 1915 into absorption of UV and IR by arable soil and included both kinds of photographs. It is remarkable that only a few years after Wood demonstrated that the world could look different in infrared (and UV) that these two researchers used photography to investigate aspects of this in detail. I would like to find out more about these two. Anyone know anything more? Is there or is there not an infrared Olympus Pen?